A labyrinth is not a maze. There is no intention to fool you: there is one way in and one way out. You simply follow the path to the center and then back out, a metaphorical equivalent to any number of spiritual traditions. Walking a labyrinth can be a walking meditation if you do it with intention. Taking the step, intention inseparable from action. It falls into a rhythm, step after step, clearing the mind. For the last year, I have been working to rewire my brain in response to some neurological difficulties. Choosing alternative modalities of treatment in lieu of the bag of drugs the neurologist handed me, I made steady but uneven progress. Bodywork, meditation, exercise, music became part of my daily routine. Recently, my wife suggested I add labyrinth walking to my regimen: “I think if you walk a labyrinth once a week, you’ll be healed.” She described her experience walking a labyrinth and I decided to give it a shot. 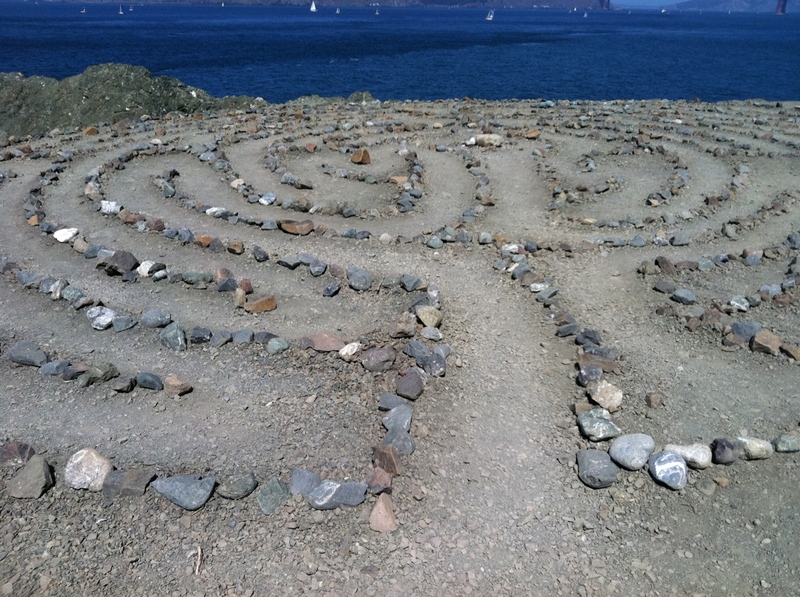 A Google search located three labyrinths in San Francisco and I decided to visit the one at Eagle’s Point along the Land’s End trail where the bay meets the ocean. 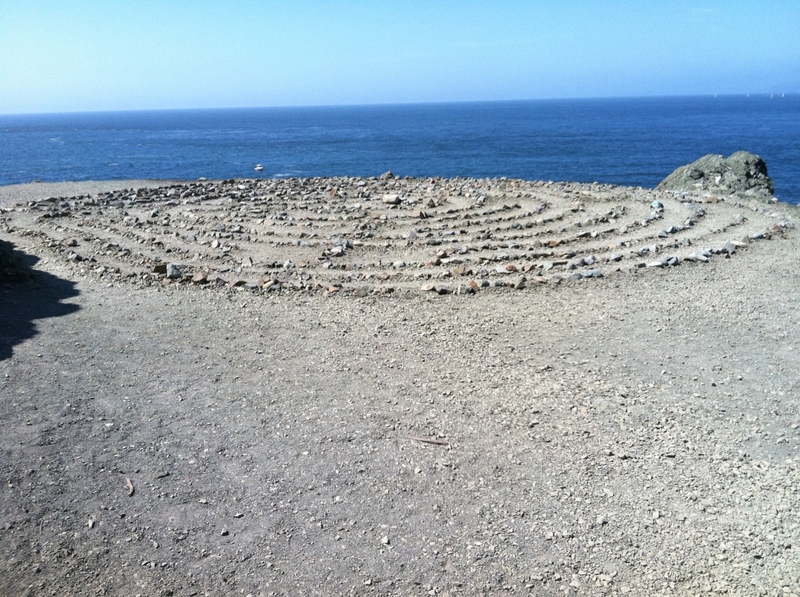 A drive across town and a forty minute hike led me down the bluffs to a labyrinth perched on a cliff. I entered the labyrinth and tried to walk the path with singleminded intention. Maintaining the clarity to keep an even gait was harder than I imagined, especially when the outer circle of the labyrinth passed within three feet of the sheer drop to the rocks and water a hundred feet below. I followed the circuitous path to the center, stood for a while then retraced my steps out of the labyrinth. I left the labyrinth refreshed and inspired, and a little mentally tired. A beautiful sunny day, the experience of walking the labyrinth on the edge of the cliff had left me with the feeling of possibilities. A number of the healing modalities I’m using are premised on the theory that brain waves need periodic recalibration. To me, walking the labyrinth was most like becoming absorbed in listening to a piece of music. Like deep listening to music, walking a labyrinth can take you away to another world and bring you back reoriented to this one. To learn more about how music recalibrates human brains, read William Benzon’s Beethoven’s Anvil: Music in Mind and Culture. To learn more about labyrinths, go to Wikipedia Labyrinth page, The Labyrinth Society, The Labyrinths of Grace Cathedral.